1950 Collective, an Austin-based clothing company, has heard the cry of an overlooked niche: young women who like boy bands and who want better quality band merch. But the company has not limited its mission to fulfilling the wants of One Direction fans. Co-owned by University of Texas (UT) Sophomore, Nishiki Maredia, and Boston College Junior, Angela Jin, 1950 Collective is committed to changing minds and improving conditions for women, refugees, and other marginalized groups in the United States and abroad. Maredia and Jin launched the first 1950 Collective fashion line in January of 2015. Much to their surprise, young girls responded not only by clicking to purchase but also by commenting on social media. “They even emailed us to say they didn’t think they could wear certain kinds of clothes, like crop tops, because of their body types,” says Maredia. The two owners encouraged those girls to embrace their unique body shapes and sizes and quickly dispelled the notion that only certain kinds of girls could wear certain kinds of clothes. Customer conversations helped to spark a larger-scale dialogue on feminism. Many went from fans to customers to silent contributors, offering the owners fresh ideas for designs and T-shirt messages. “We got the idea to use the platform to educate girls. Angela and I didn’t know if it would go over well because it was outside of the bubble,” says Maredia. 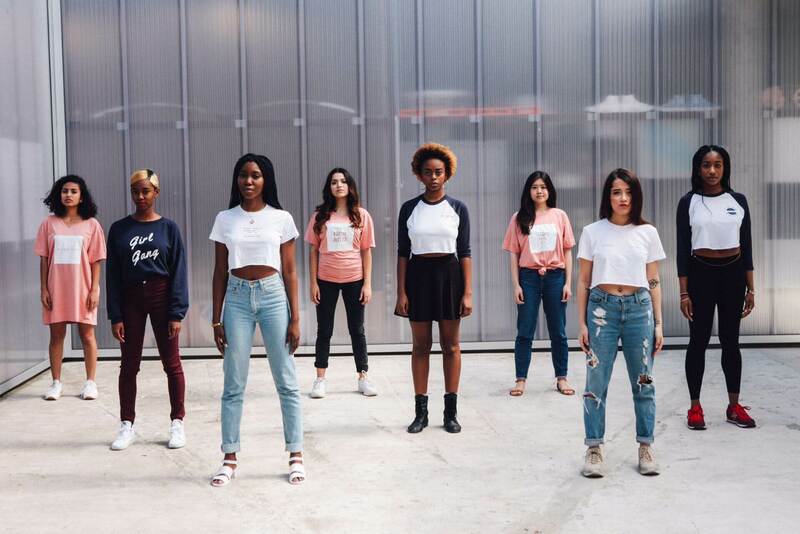 “But, girls need to know they’re not alone if they have body image issues, or issues like depression.” The company encourages all to embrace the title of “feminist,” and shows women of all shapes and sizes that they can love their bodies. Besides addressing body image issues head on, 1950 Collective freely takes jabs at cultural appropriation cropping up on the runways and streets. T-shirts that say “My culture is not a trend” and “My culture is not a costume” send a clear message to designers. “[Designers] just choose bits and pieces of other peoples’ cultures without actually caring about the people within those cultures,” says Maredia, who is an Indian-American born and raised in Texas. She disapproves of throwing motley bits and pieces onto runway models unless it sparks meaningful dialogue about the culture(s) represented. At the outset, the two entrepreneurs decided to donate 10% of sales to a different cause each month. Thus far, they have donated to the National Alliance on Mental Illness, United Way of Genessee County’s Flint Water Fund, and The Girl Store among other organizations. In the wake of the Paris attacks, 1950 Collective expanded its philanthropic reach and donated proceeds from the sales of T-shirts which say “Terrorism has no religion” and “Say no selective empathy” to refugees in Syria, Jordan, Lebanon and Turkey through United Muslim Relief – Global Charity Organization. For every shirt sold, seven patients received medical care. For every seven shirts sold, affected families were fed for a month. As far as the selective empathy message goes, Maredia explained that she and Jin “empathized with Paris, but lots of corporations in the US were already donating to them.” Many affected Parisians also received monetary help from the French government. “And, there were also attacks in Lebanon and Beirut,” says Maredia. Frustrated that victims from “non-Western” countries were brushed off, Maredia says, “It’s as if they are not deserving of empathy because people can’t relate to them.” The hot-button T-shirt was released shortly after the attacks and some backlash ensued. But the two entrepreneurs did not shy away from controversy. Their campaign continued on, and to date, they have donated nearly $1,000 to victims of terrorism across the Middle East. While initially compelled to deal primarily with women’s issues, 1950 Collective is beginning to focus on the intersections within feminism like race and transgender rights. They have already designed tees with mottos such as “Support your Sisters not just your Cis-ters” and intend to work with transgender models soon. The company currently reports over $200,000 in revenue, although it only incorporated at the beginning of 2015. Its main sources of revenue come from small bands as well as fans who buy directly from the website. The company recently made a deal with American Apparel for a spring line, which will feature T-shirts, crop tops, sweatshirts and even accessories like hats and cell phone cases. While business is good, Maredia and Jin are especially proud of the artistic and social conscience embodied by the brand. And, reasons for their overseas donations go beyond philanthropy. “I don’t like the way it’s being discussed,” Maredia says, upset by the reactionary attitudes toward Syrian refugees. “Those not wanting to accept refugees are not aware of how bad it is in Syria.” She claims that concerns of refugees stealing jobs or joining ISIS are unfounded. Politicians across party lines in the United States have stated that Muslims are “the front line of defense” against terrorism because they are uniquely situated to prevent attacks. Others suggest that Muslims should condemn the actions of terrorists. In spite of Maredia’s strong opinions against the entire Islamic community being held responsible for the violent actions of extreme groups, she does feel that Muslims should respond to terrorism with solidarity. “We should help [to stop terrorism] in every way possible. That includes getting involved in the political process.” Maredia is a Government and History major at University of Texas (UT) and is keenly aware of lack of Muslim voices in the legislative process. She points out that Muslims often contribute in the business arena, but that the current political reach of Muslims is unviable for meaningful change. The struggle for justice and peace continues, and 2016 brings with it several important projects for 1950 collective – one of which is geared at the unique struggles of South Asian women. The Desi Collection features message shirts bringing light to issues within this community such as forced arranged marriages and skin bleaching. Other shirts will address issues such as cultural appropriation and South Asians being reduced to harmful stereotypes. 1950 Collective began with two CEOs and now boasts a larger team which includes an operations manager, a social media intern and a design intern. With the help of this new crew, Maredia has turned her rapidly growing business into a part-time gig. She is currently contemplating summer internships and hopes to find a placement where she can further her knowledge of social entrepreneurship or non-profit while continuing to grow the brand. While the philanthropic accomplishments of the 1950 Collective are remarkable, Maredia’s goal is to take the charity initiative even further in upcoming seasons.